One of the ongoing discussions in the current multicultural landscape of The Netherlands is the validity of a children's festive event in early December called "het sinterklaasfeest". It is an ancient Dutch variety of a broader ancient European cultural folklore in which one of the two leading characters is a character called "Zwarte Piet" (Black Peter). It is a person whose face and hands are made black and he (or she) plays the merry and lively counterpart of the solemn and wise main character called "Sinterklaas" or "Sint Nicolaas" (Saint Nicolas). In the mean time the majority of the Dutch people have been accused of racism by several left-wing extremist groups with "an agenda". Poorly informed and bias foreign media now all too often jump on the bandwagon of self righteousness with all sorts of fact-free opinions about this utterly harmless tradition. Time for some long overdue education. From the Year ± 270 to 340, in the Byzantine city of Myra (Turkish since 1468) there lived a bishop called Nicolaos. He gave money to the poor and he was said to perform miracles. The myth of this remarkable saint spread all across Europe in many variations. On December 6 in the Year 340 St. Nicolaos died. Since the 13th century the celebration of Saint Nicolas is widespread in Western Europe as the most worshiped patron saint. He is considered being a protector of, among others, students, young adults, merchants, sailors and travelers. In the Middle Ages, before the death anniversary of of the holy man of Myra, a "child bishop" plus assistants were chosen from the poor children of a city. They received food and footwear. The remaining children received money and a free day on December the 6th for celebrations in honour of St. Nicolaas. Later on, all poor children were treated with presents, which developed into a common public tradition, in which shoes played a major role as a finding place of small treats. By now here have been plenty of scientifically substantiated publications about the Black Peter phenomenon and the historical backgrounds. Some sensible, other senseless, poorly substantiated or far fetched. Sometimes it seems that the devil and his mother (Dutch saying) is dragged into the "Black Peter debate". And in this case that just may be a good idea! 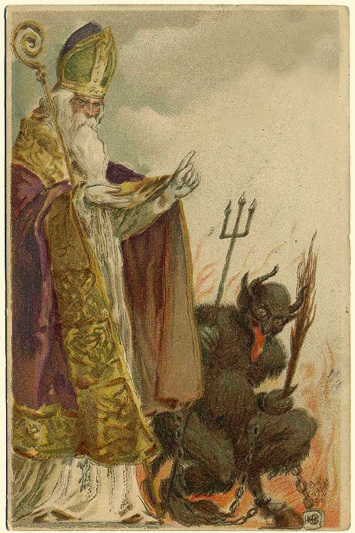 For in some older versions of the myth, the Saint was indeed accompanied by a black demon, which was sometimes called Krampus. This ghoul was equipped with a row for punishing his victims and often even a trident to repel disobedient children. Any exciting story works best with contradictions, such as good and evil; In this case a saint and a devil. The "Sinterklaas" tradition that I grew up with in the 1950's, is one with exactly one saint and one black Peter. "Sinterklaas" was a family event and not a big media show. To a child it was one of the few highlights of the year. Common people were not rich, so giving gifts to the children was limited to their birthday and the "birthday" of this saint on December the 5th. Christmas was still a predominantly Christian celebration without gifts, for Santa's Claus, as the American interpretation of Saint Nicolaas in the form of an obese Coca-Cola drinker with a sweat shop with dwarfs on the Arctic, had not caught on yet in Western Europe. Saint Nicolaas was a mythical entity, just like his helper, Black Peter or Pieterknecht. "Knecht" (sort of servant) was the indication of an employee without professional status. The term did not have the negative connotation that it was given later. Not as if a child would have a notion with these concepts. The saw it how it was: Peter wore the big bag with gifts because he was the strong servant and his boss, the bearded Saint, was very very old. Hundreds of years! Sinterklaas rode on his white horse over the rooftops, and Black Peter aided him in distributing the presents. In Peter's jute bag for the gifts, children who had been extremely naughty could be taken back to Spain. The tradition in this form was created by the Amsterdam teacher Jan Schenkman, who wrote a children's book about Saint Nicolaas in 1850 with stories and songs. The servant of Saint was no longer the traditional, terrifying black devil (Piet, Peter or Krampus) or a similar ghoul (Knecht Ruprecht, Schmutzli or Hans Trapp). He chose a significantly less scary servant in the form of a 16th-century Moorish page in colorful Renaissance clothes as worn at the Spanish court. The saint himself now lived in Spain, and traveled from there to the Netherlands by steamboat and vice versa by train. In 1850 these were very modern means of transport indeed. Neither Schenkman, nor his illustrator Peter Geldorp, ever reveiled why he choose a black servant for the new character of Pieter. The devil was usually depicted black, so a dark Spanish page as his servant probably seemed the most obvious (and a more child-friendly) substitute. As black as the night to give him something sinister and mystical. Additionally, someone who plays for Peter will be unrecognizable for children when wearing a pitch black make-up. Perhaps the exotic element of a servant of African decent, if that what it was meant to be, also played a part in the choice of the 19th century teacher. People with an African appearance were still a fairly unknown phenomenon in our streets. Just like Krampus, that new servant still had a roe (a bunch of branches) as a means of correcting naughty children. Until the end of the last century, it was quite normal for educators to give disobedient children a good spanking to teach them to behave. I know, unthinkable in thise times of the easy-triggered, hypersensitive generation snowflake. In the early 1970s prosperity grew. This caused the Sinterklaas celebration to become increasingly more commercial. In order to festively decorate shops and windows, more and more Black Peters were added to the entourage of the Saint. Strangely all of them were also called Black Peter, what must have put quite a strain for the old saint's communication skills. Or was that one of his miracles also? 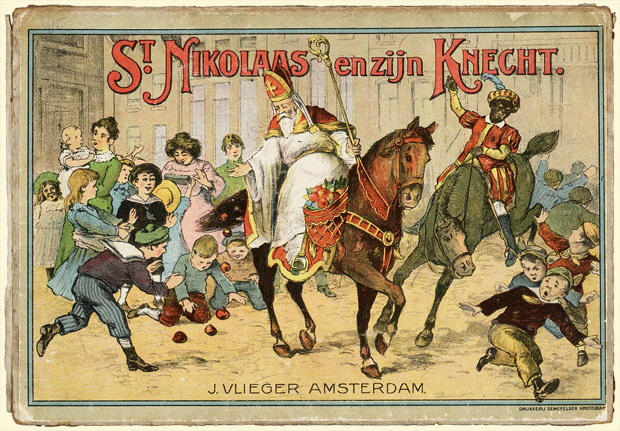 Since the intensive TV broadcasting of the Sinterklaasintocht (the festive arrival of St. Nicolas in the Netherlands) by the national media and later the Sinterklaas TV programs, the number of Peters had been grown almost infinitely to offer the public the desired jolly and playful experience. Those high numbers of Peters were sometimes used to explain how these multitude of gifts could be delivered to all children. This is a bit strange, because if you need to explain logistics and distribution, your target audience is really too old to believe in fairy tales. Undoubtedly it was good for sales and viewing ratings, but it also was a bit odd. Was Black Peter no longer a unique individual, just like his holy boss? Was he no more than a generic black helper that served only as a colorful addition? This is where things went wrong. Starting the early 1980s it came to my attention that visitors from abroad, and especially from the United States, began to give strange looks towards our innocent national celebration. They were closely acquainted with the racial discrimination deriving from their own slavery related past and saw, to the surprise of many Dutch, comparison with the abused slaves on plantations and the condescending treatment of those descendants. That rather blunt association - was it perhaps a projection of the atrocities in their own cultural past? - was not endorsed or even understood here. Not at least because native Dutch people had never experienced slavery and its consequences closeby. That was something unfamiliar bad people had done long ago in far and exotic places. And although the appearance of Black Peter seems to be somewhat modeled on an African man, perhaps even as a kind of caricature, there was never any direct reference to Negroesnote and even less so to black slaves. Not even in Suriname, where it was also celebrated as a tradition among the population of all colors. Next to nobody saw Peter as an African, but exactly as it was meant to be: a fictional figure in a children's fairy tail. And most importantly, there never was any intention of misrepresenting or lack of respect towards any race or group. With the arrival of increasingly more people from our overseas regions, slowly but surely protests were heard. Mostly initiated by native Dutch people with a cultural inferiority dysfunction and a compulsion to be policor. Usually the real reason is selfishness; financial or political gain. Some of them also want to position themselves as morally supreme above the "vulgus". It's a small group who can shout loudly and gets a lot of attention in (oh irony!) precisely those media that had assigned all those alleged "negroslaves" to the holy man. Even a ignorant volunteer worker at the UN called Verena Sheperd tried to profit from this for her debilitating slavery recovery payments project by spouting unfounded racism allegations. The fact that she thwarted a whole nation as racists was apparently not a problem. After all, it was all about her hard coins and her five minutes of fame and only that is important. Another downturn in the often pathetic protests was a manically screaming Quinsy Gario who scared the hell out of innocent little children during a Sinterkassintocht. In fact exactly like the old-traditional Krampus / Black Piet would have done it. Strange what this cult of fictitious victimization can lead to.. 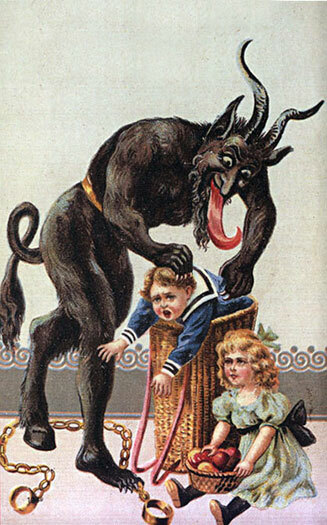 The often-mentioned "ancient tradition" is that of the altruistic Saint who gave his money to the poor and his partner the Devil (Piet / Krampus / Ruprecht) to freighten and punish naughty children. I can easily say that this old tradition has not been celebrated for quite a long time. The broad-based folk tradition is the version of Saint Nicolas and Black Peter from Spain. It was celebrated within the family circle and not in the national media. That version is about one and a half centuries old and, in the meantime, can also be called a tradition. However, a saint with a wide range of Black Peters is a fairly recent commercial development / depletion and has nothing to do with the essence of this tradition. Rational or not, apparently, for a certain group there are serious sensitivities here, that shouldn't be ignored. The purpose of traditions is to connect and not to divide. How to do justice to both the "ethnic hurt" and those who support the preservation of our cultural traditions? A good next step in this tradition is I think to return to the now popular Saint and Peter, which are largely shaped by Schenkman's ideas. So at major public events, exactly 1 Saint Nicolaas, as a sort of caricature of an ancient holy Roman bishop, with 1 pitch black Black Peter as his all-time companion. Even if the man (or woman) is already pigmented: always paint him black! And refrain from any weird offensive form of speech (comparable to pigeon-english), as you sometimes hear on national TV. That in many ways contrasting couple are the core of the ancient tradition. Anything added in the form of a variety of different comic and acrobatic aids is unrelevant to the essence of our beloved December tradition. But do not give those additions a forced negroid appearance, and preferably do not call them "Pieten". This way misunderstandings are avoided and not anyone has a plausible reason to feel themsalvesabused, harassed or hurt. Then again it becomes the old traditionally warm and friendly sinterklaasfeest to be enjoyed by everyone. Especially by the children for whom the whole festivity is intended in the first place.